No, I don’t have millions of worshippers. Yet. When showing file names, one theory is that you show the “.txt” and “.png” extensions, since they are the true file name, and another theory says that you should hide them, since they are ‘scary technical details’ that Joe User shouldn’t have to deal with. What if we combined both ideas rather than either one or the other? 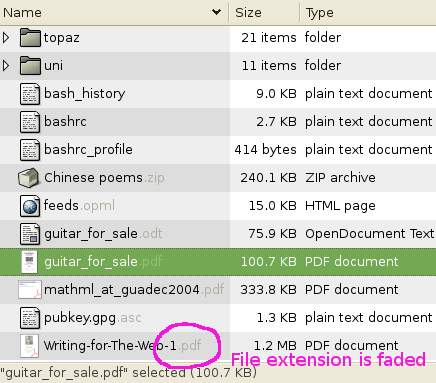 Nautilus already makes the distinction when renaming a file (it selects only the “foo” of “foo.txt”), so should we also make the same distinction when showing a file’s name? Not bad at all, I like this.